Most regulatory documents issued by Russian government agencies and state corporations are required to use Times New Roman, which has become a standard font for official documents in Russia. RusBITech, developer of the Russian operating system Astra Linux, has been unable to include some popular fonts in its word processing software suite, including the standard font used in official documents, Times New Roman. Copyright for those fonts belongs to the U.S. company Monotype Imaging, which has declined to sign a contract with RusBITech because of the latter’s business dealings with the Russian Defense Ministry. In order to ensure compatibility with documents created on Windows computers, equivalents of the popular fonts need to be developed. In early December, the Russian Ministry of Telecom and Mass Communications held a meeting with the developers of Russian operating systems. A representative of the research and production association RusBITech, developer of Astra Linux, said that Monotype Imaging, the copyright holder for many popular fonts, had declined to sell them a usage license. The news was first reported by two unidentified Kommersant sources from the IT sector and later confirmed by Yuri Sosnin, director of RusBITech and head of the Astra Linux developer team. The companies were in talks about including the fonts in the Astra Linux package and came close to drafting a contract “despite rather high royalties,” Sosnin said. According to him, the deal fell through at the last moment when Monotype Imaging declined to sign it, citing the international sanctions against Russian companies working with the Defense Ministry. They made the connection after seeing reports that RusBITech had participated in Russia's biennial International Aviation and Space Show (MAKS). Monotype Imaging was not available for comment. Russian business daily Kommersant cites two unidentified sources as saying the company was never particularly interested in a deal and quoted excessively high prices, citing a figure of $690 for each Astra Linux workstation with a suite of fonts that would include Times New Roman, Arial, Courier New, Tahoma, and Verdana. Later, in the course of negotiations, that figure was brought down to about $148 for fewer fonts. Another unidentified source said that Monotype Imaging quoted a price of just $3-4 per workstation to some other companies. “Probably, they did not want to refuse [RusBITech] pointblank and were hoping that the other side would be put off by the price,” the unidentified source said. In the end, RusBITech, along with the Paratype company, had to develop Times New Roman equivalents: public types Astra Sans and Astra Serif. 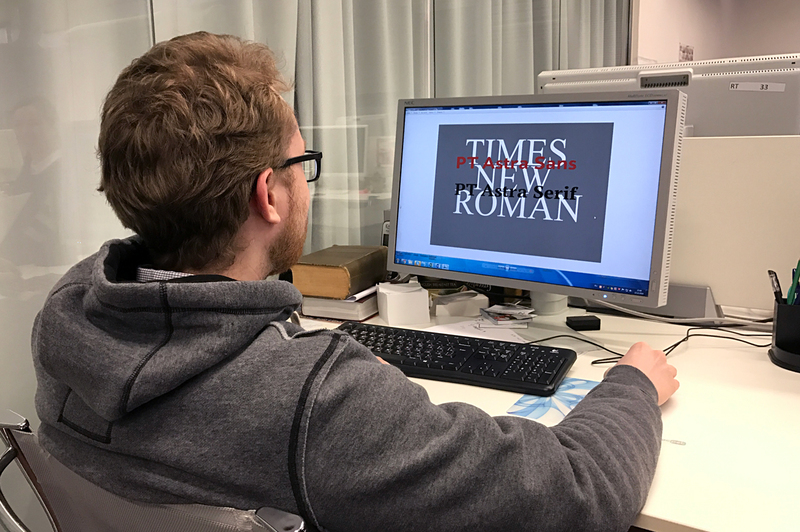 However, most regulatory documents issued by Russian government agencies and state corporations are required to use Times New Roman, which has become a standard font for official documents in Russia, Sosnin said. "It is one of the thorny issues that prevents active import substitution in the state sector,” he continued. In May 2016, Russian Telecom and Mass Communications Minister Nikolai Nikiforov raised the same issue when speaking in the State Duma. He pointed out that state officials were using Times New Roman and submitting documents in the .doc format, which made import substitutions rather difficult. Sergei Aleksandrov, commercial director of NTC IT ROSA, which develops the Russian operating system ROSA Linux, said that for the time being the company had no plans to seek a license from Monotype Imaging. Instead, it is using fonts from the freeware suite LibreOffice. BaseALT and AltLinux also decided not to use Monotype Imaging fonts, having opted for similar versions, said Alexei Smirnov, adviser to the BaseALT managing director and former managing director of AltLinux. However, he added, if font metrics in an operating system are considerably different from those used in Windows, users will find it difficult to share documents because their layouts will not match. RusBITech has been developing Astra Linux since 2010. According to the company’s annual report for 2014 (more recent data have not been made public), its main customers are the Russian Defense Ministry, the Federal Protection Service, the Federal Security Service, the Foreign Intelligence Service, the Federal Customs Service, and the Health Ministry. In 2014, RusBITech signed contracts worth 1.7 billion rubles ($29 million).